The Tata Tiago has a good dash of technology inside, making it one of the most well-equipped hatchbacks in the Indian auto market. While the drive could have been better, the new, refined cabin does feel like a good place to be in. 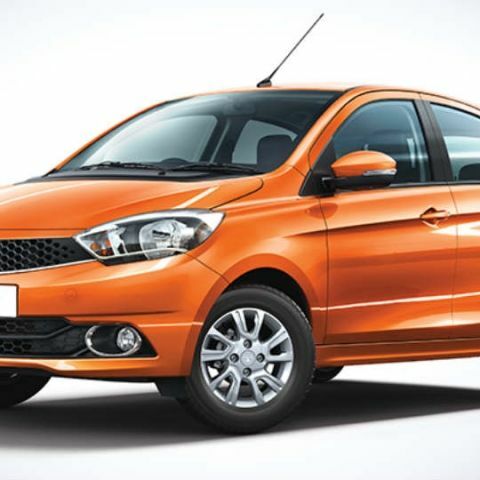 The Tata Tiago is one of the newest hatchbacks to have been introduced in India. It is a part of Tata’s endeavours of revamping its image in the industry, and the company now wants to appeal to the discerning, style-conscious buyers of the country. As a result, the Tiago does not merely include the basics of a car, but much more. To begin with, you will instantly notice the better styling on the Tiago. The car looks proportionate, and the weight of the vehicle is well distributed. It looks like a sharper, more crisp version of the first Hyundai i20, and that is a good thing. You get neat creases along the sides, and the ride height is also quite good for a hatchback primarily aimed at city drives. Top-spec variants of the Tata Tiago also get additional details like LED ORVM indicators, body colour air vents on the inside, and more similar additions that make this car feel neatly designed and planned out. It is the technology inside the car, though, that impresses us more than either the styling or the drive quality. The Tiago is quite literally a smaller sibling of Tata’s recently unveiled SUV, the Tata Hexa. 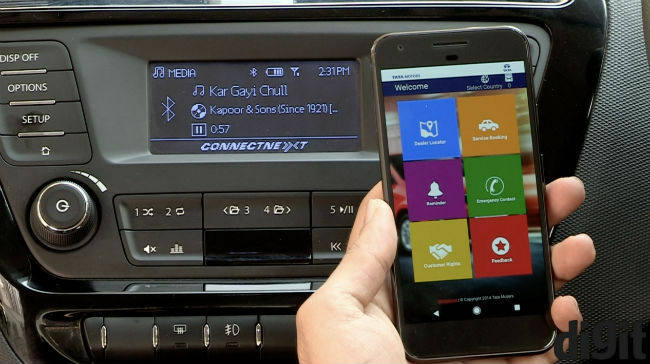 The central console on the top variant is powered by the new ConnectNext platform based on BlackBerry’s QNX OS and built in association with Harman. The infotainment unit has a number of applications, including audio playback, navigation, handsfree calling and voice input, and also has steering-mounted controls to go with. 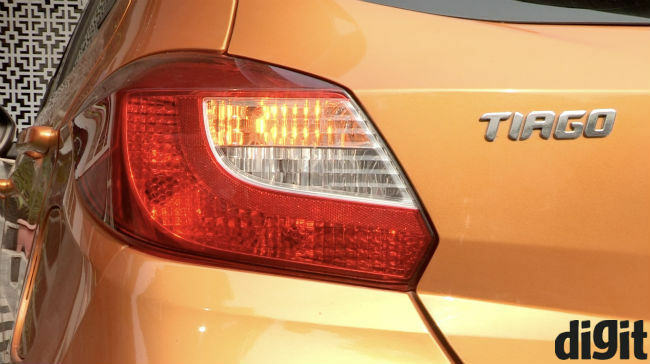 With all of these in sight, here’s looking at the Tata Tiago, in closer detail. 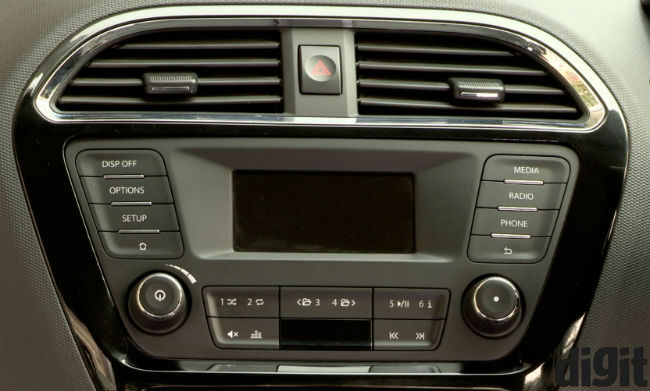 As mentioned previously, the Tiago’s infotainment unit is based on Tata’s ConnectNext platform, built on BlackBerry’s QNX operating system and customised by Harman. In the more expensive Hexa, Harman provides a 5-inch colour display and 10 JBL-branded speakers. The Tiago, meanwhile, gets the same system, on a smaller scale. It has a smaller, monochrome multi-information display that does not relay graphic information due to its colour limitations. The central console includes options for Radio, Music, Navigation, Phone and Settings. You can access your car settings for central locking and lights, Bluetooth connectivity and audio settings. Pairing via Bluetooth is fairly simple — go to Bluetooth devices, ensure that your console is discoverable, and hit pair from your phone. You will be asked to confirm pairing once, following which it gives you a confirmation code to match with your phone, after which your phone will be paired with your car’s infotainment unit. 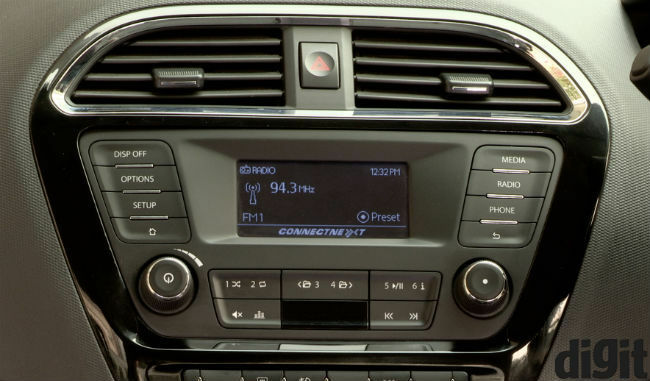 You can also play music via the USB (iPod) or 3.5mm aux ports, if you do not wish to connect via Bluetooth. The setup, though, works differently for Android and iOS devices. For iOS, you can pair via Bluetooth to play music, and wirelessly receive calls. You can also use the voice commands to summon Siri, for quick searches. Voice reception is fairly decent inside the car, and the in-car noise insulation adds to it working more efficiently (more on this later). However, for navigation info to be displayed on the console, you are required to use the Tiago’s own Navigation app (developed by MapMyIndia), and the app is unfortunately only available on Android, as of now. Switching to Android, you get a host of more features that add to the entertainment quotient. 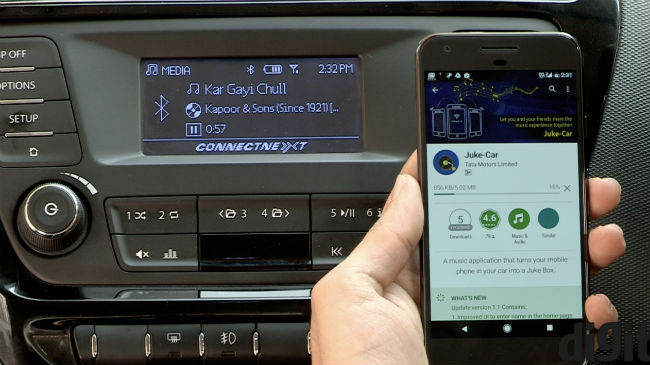 Tata’s ConnectNext suite includes JukeCar, Navigation and more. JukeCar basically uses the phone’s mobile hotspot features to let all the car passengers connect to the phone via Bluetooth to the central console. This is a neat addition, as you will not need to repeatedly unpair or switch sources to accommodate everyone’s music preferences. JukeCar allows you to line up tracks from everyone’s phones, giving a neat, versatile addition to the car’s infotainment unit. To add to all of this, you can pair up to 10 Android phones with the ConnectNext system here, which makes it quite well rounded. However, everyone wishing to use JukeCar will need to have an Android phone to make the most of it. When it comes to navigation, Tata’s Navigation app in the ConnectNext suite is fairly accurate. It takes a while longer to track the best route, but has always turned out to be quite accurate in terms of tracing routes. The voice-assisted navigation is also quite helpful, as it alerts you 200 metres before making a turn, and then right when you are taking the turn. The display does not give a graphical representation of routes, but shows information about your next turn, a logo to show the direction, and even distance to your destination. The service is fairly neat, and helpful. You won't get traffic data, though. For Music, tap on Media to switch to the music interface. You can switch tracks and control volume from the steering, and the audio balance of the speakers can also be toggled with, in terms of Bass, Mids and Treble. Each frequency range can be tuned between 0-10, and by default, the speakers do sound slightly bass-heavy. The 8-speaker setup is not JBL-branded as it was on the Hexa, and does not get a dedicated amplifier and subwoofer. The speakers are mounted on the doors, and by default, the audio quality is actually quite impressive. There is a good balance of bass and the speakers do sound fairly rich. They are also amply loud, and I never pushed the volume level beyond 14, with max volume set to 30. 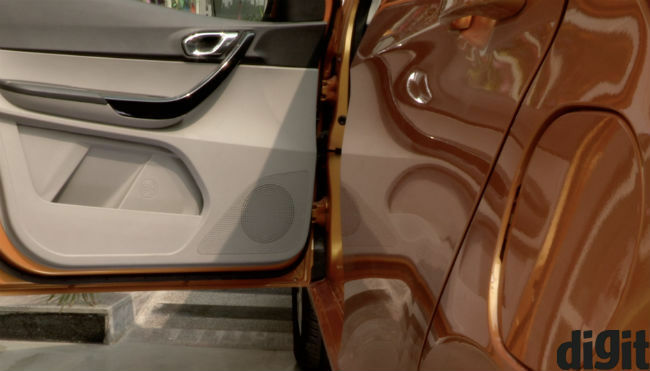 Notably, there is audible distortion from the in-car speakers if you belt out music at higher volume level than 17, but for most buyers, an upgrade in terms of in-car audio will not be required. 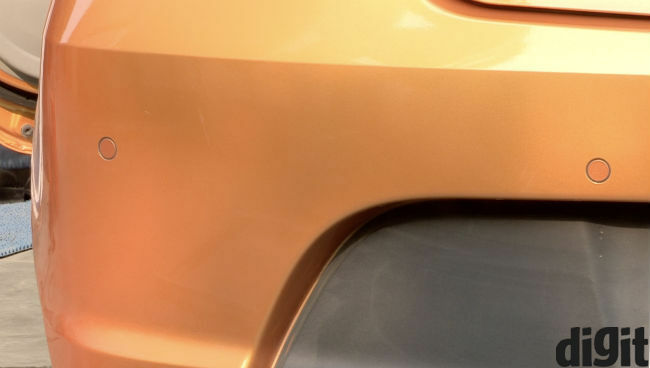 The car also gets rear parking sensors, which is a part of the Tiago’s enhanced safety features. The parking sensors alert you to halt entirely when you are still almost a foot from the nearest obstacle, which in my opinion is fine, unless you have to make a turn in a very tight corner. However, the only problem that I really faced is that the parking sensors seemed to be slightly slow. This can become slightly problematic if a car happens to be crossing just when you are about to reverse the car. The alarms go off nearly a full second after when it should, and you should ideally not rely entirely on the sensors. You also get a host of alarms for seat belt and park brakes, which are standard inclusions in a car with so many features. There is also an information display in the instrument cluster, which displays the time, a tripmeter (for individual trip distances), odometer (for net mileage), average fuel consumption and instantaneous fuel consumption readings, and even a distance-to-empty reading. The instantaneous fuel consumption scale, fluctuating with how you drive, is actually a good way to monitor your car’s efficiency, and improve your driving in city. 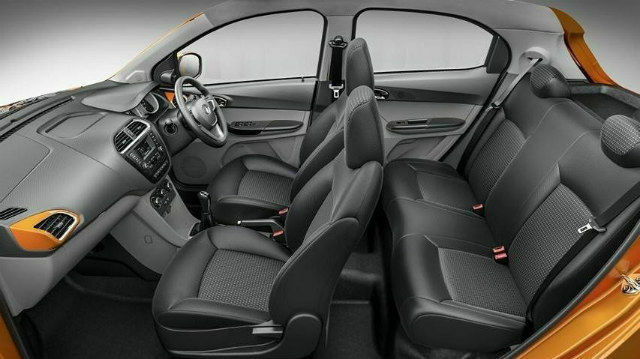 On overall terms, the Tata Tiago is among the most well-equipped hatchbacks in India in terms of the in-car technology and entertainment options provided. It packs in almost all the essentials, and the only thing that I really missed were Tata’s ConnectNext suite of applications for iOS. The Tiago provides great value for your money, too, and we can safely consider it to be at the very top of the lot in terms of in-car technology in its segment, probably along with the new Ford Figo. The Tata Tiago is aimed at city commutes, and it makes this very clear from the start. Fire the vehicle up and coast out of your driveway, and right from the onset, you will realise that the Tiago is not meant to be pushed hard down highways. This, coupled with a number of other factors, combined in making the drive a mixed experience. To begin with, the top-of-the-line Tata Tiago uses a 1.2-litre Revotron petrol engine, which produces 85ps power at 6000rpm, and 114Nm of max torque. In comparison, similar competitors like the less expensive Renault Kwid (petrol) produces 71ps power, while the more expensive Ford Figo (petrol) produces 88ps power, affirming that the Tiago is again among the best in its class when it comes to the crucial specifications, at least on paper. However, there are a few elements that did not quite fit the bill. For one, the engine seems to be rather noisy, and slightly lacks in terms of refinement. The hum of the 3-cylinder engine is quite distinct, and on overall terms, you may find quieter and more refined engines in cars like the Hyundai Elite i20. The power delivery here, although rated quite high, is not as great. In initial revs, there is a distinct lag that you will come across in the Tiago. The uninspiring power delivery from the engine continues till you hit the 4th gear, beyond which the Tiago suddenly feels much better and zippier to drive. The Tata Tiago is not the fastest around, and accelerating or shifting upward rapidly is rather cumbersome. You will find yourself labouring hard to shift up fast, and the Tiago partially has its slightly higher body weight to blame for it. While the engine should have been up to the task, the lack of spontaneous power delivery makes the drive difficult to be called enthusiasm-filled. Adding to this is the rather stiff clutch that makes gear shifts a bit of a task at times, and the rather slow and slightly blunt brakes that make it difficult to hit brakes suddenly if you encounter a sudden obstacle. However, once you hit the highway and accelerate beyond 70kph, the Tiago suddenly seems to drive better. Acceleration is still slightly on the slower side, but the car feels sure-footed, steady and comfortable as it accelerates to 100kph and beyond. While the power delivery, brake intensity and clutch uniformity could have been better, one area where the Tiago really excels is in making you feel assured at high speeds, even at 130kph. The engine does not feel too strained, and the well-weighted steering wheel adds to this. There is a noticeable dead center on the steering wheel, but nothing that is unusual. It is fairly accurate, which helps the Tiago maneuver turns and bends quite well. Even at 130kph, I could switch the car between lanes as needed, and the car holds itself steady and firm on the highway. Ground clearance of 170mm is yet again among the best, and is crucial for Indian roads. The suspension, though, is somewhat stiff. This does seem to be a slightly unusual choice by Tata as the Tiago is a thoroughly city-drive car, while the company’s choice of the stiffer suspension makes it great in terms of high speed handling. In city roads, however, the ride is slightly bumpy, and this can be felt even more in the back bench. On overall terms, though, the Tiago is really a mixed bag. It drives smoother and better at higher speeds, but the lag in power delivery from the engine is evident at slower speeds, making it a slightly less engaging and more difficult city ride. In what is a pleasant surprise, the in-car NVH (noise, vibration and harshness) levels are quite low, giving the cabin an air of comfort and seclusion. The air conditioning, though, could have been much better. It certainly does feel inadequate, at least in terms of cooling. Crank up the fan speed, and the AC can get really noisy, betraying possibly the only loose bit in an otherwise well-refined cabin. The cabin itself is not a bad place to be in. The fabric seats are quite plush and comfortable, and fare well even in long drives. Along with the low NVH, the quality of the interiors further contribute to upping cabin quality. There’s good quality plastic on the dash and the doors, and the roof of the car is also made of good quality fabric, stitched fine and firm. The cabin is further accentuated by AC vents coloured in the same tone as the exterior finish, which adds a dash of dynamic styling here. You can also adjust the seat to the perfect height, distance and recline, and I could conveniently find my driving position here. To sum up, the Tata Tiago is reasonably easy to drive in the city, and fuel economy takes prime importance here. The steering is well-weighted, and if you can do with even lesser power delivery, there is an Eco mode to drive in, that gives even better fuel economy in exchange for a less enjoyable drive. 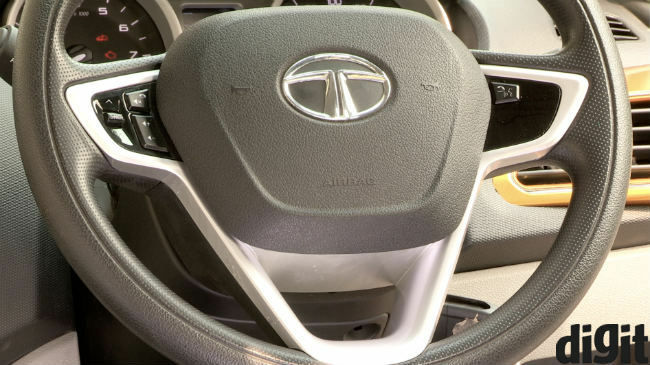 The overall build quality of the car is quite good, and this is one of the best hatchback cabins around, certainly the best that Tata has ever built. The Tiago feels better to drive at higher speeds, which is somewhat of a surprise since this car has been built to suit city driving. It also gets a host of safety package, including driver and front passenger airbags, ABS with EBD, Corner Stability Control, speed sensing door lock, and clutch lock, making it a reasonably well-heeled passenger hatchback. What really shines through with the Tiago is Tata’s intent behind it. The Tata Tiago feels way more premium than previous Tata hatchbacks, has a great infotainment package that includes almost every essential element you could have hoped for. It also has a fairly great cabin, and interior quality is appealing. However, the stiff suspension and harsh clutch takes a bit of the shine away from its primary job — city driving. The engine is also somewhat less refined, and even the power delivery feels stuttered. Despite that, the Tiago feels well balanced, grounded and safe. Once you do speed up, the Tiago is quite decent to drive, and the on-road stability is assuring. On an overall note, the Tata Tiago does leave you with more positives, and for its pricing, offers great value for the overall package in terms of the tech inside. The drive, though needs more refinement. As of now, Tata’s new endeavours seem to be on the right track.